The magenta (that's purple for you liberals) line represents the Bureau of Economic Analysis number that trails consumer data on a quarterly basis. 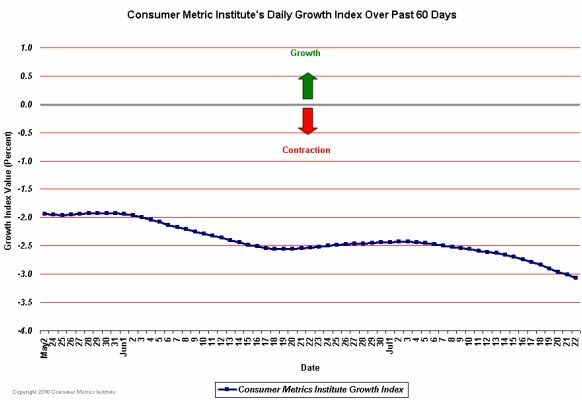 The blue (that's the color of some ink pens for you liberals) line depicts the Consumer Metrics Institute's Daily Growth Index. 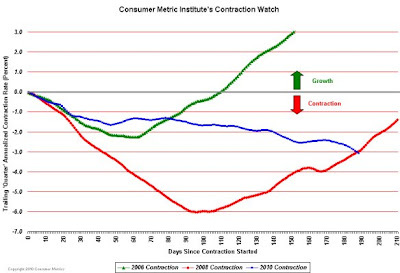 The green line represents the 2006 contraction; the red line 2008; and the blue line illustrates our current situation. In short: have you ever seen the movie Journey to the Center of the Earth? 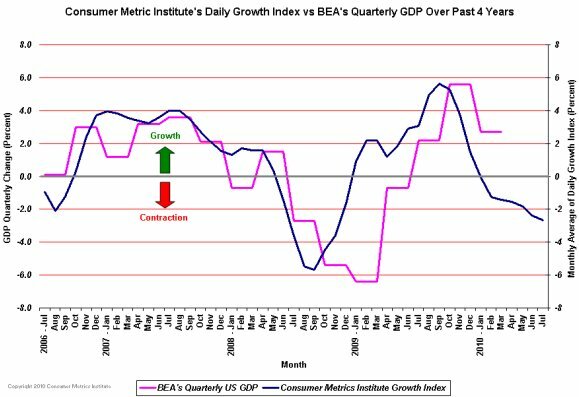 The current weighted composite sector index -- which measures activity in various sectors of the economy like retail, housing, etc. -- appears to have the following reading: "ICEBERG, DEAD AHEAD!!" 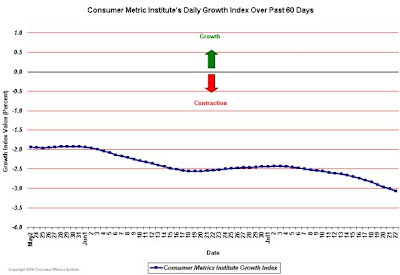 Gee, a massive tax hike in the form of the expiration of the evil Bush tax cuts ought to really spur some growth. Right, Vladimir? There were many of us, who were concerned about the discourse and emotive reactionary mindset amongst many after 2004. It was as if the Democratic Partisan deceit finally overwhelmed the much hyped "common sense conservatism". How in the world could some have begun to believe it would be a good idea to "lay down" for the likes of Pelosi, Reid, Obama, Schumer, Boxer, Clinton, Obey, Longren, Waters, etc? Somewhere, somehow, perhaps with overt fears in regards to a challenging worthy endeavor in Iraq, many lost sight of a healthy perspective and reasonable context of what the Disastrous Democratic Party provides. How could any American paying attention, not consider the utter failure and incompetence offered by the Democrats in NJ, MI, CA, LA, NY, MA, etc? Obama and the rest of the unethical Democrats went out of their way to vilify the Bush Administration and Republicans. They bragged they would be so brilliant and wonderful. "Smart Power" predictably has proven to be a nightmare. Obama and the other Democratic Partisans still seem to want to place blame elsewhere. It is laughable, and only a fool, or a Partisan in deep denial would buy into this nonsense. 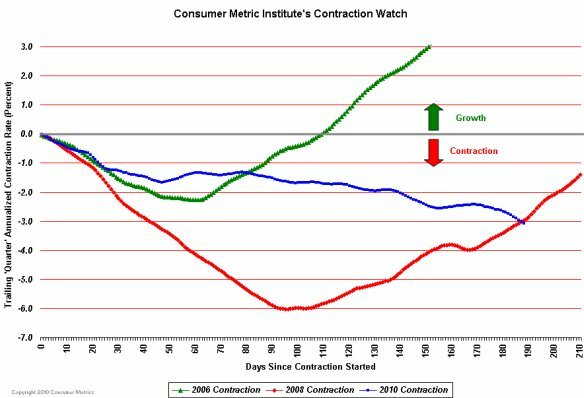 Even today, we see many who simply fail to realize the entire Economic Mess began via the Democratic Party's exploitation of the Mortgage Industry - mostly via Fanny and Freddie - which still has yet to be addressed. Medicare, Medicaid, Social Security, Fanny - Freddie, etc., are all headed for a massive bust yet again. The USA has allowed the most fashionable amongst us, peddle the most overt Politically Correct sophistry and bigotry, to empower the very worst - the Democratic Partisan rule. We are all paying for it, and will for sometime (just like when we payed for the Carter Malaise and the Clinton Malfeasance before). Some will still gripe about whether the GOP is 'perfect' enough. Let's hope the rest of the Nation is not "stuck on stupid" and gives some of the Adults more power again. Change is nightmare crushing all. Obama is a foolish collectivist snob, who is in way beyond his means. If Pelosi is removed as Speaker, there will be dancing in the streets in the USA once again.